Nicely made and a good quality comforter. Fit a king bed with a little room to spare on a 13" mattress. Giving it four stars for the rounded corners on the shams and comforter which to me looked a little to Granny. STYLISH AND ELEGANT: Our elegant coverlet set will be sure to add style and enhance decor in any bedroom. Choose from any of our rich vibrant colors! PREMIUM QUALITY Our premium coverlet set is elegantly stitched in a diamond pattern for luxury comfort that will enhance decor in any room. The hypoallergenic microfiber material will keep your body feeling fresh and comfortable all night long. 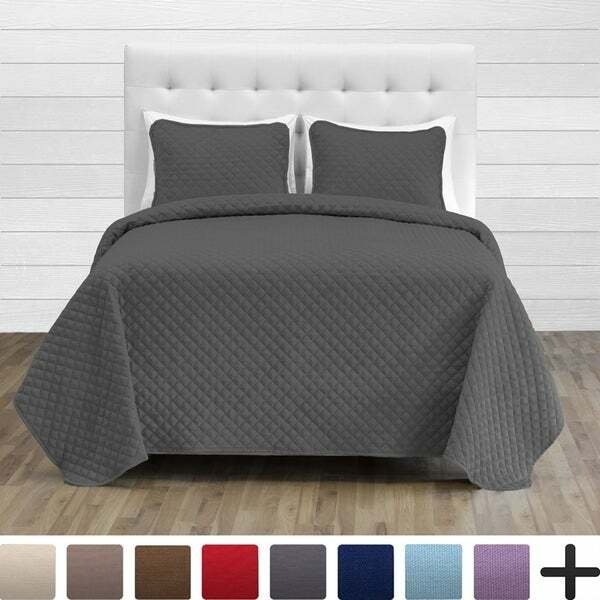 1 Coverlet Bedspread 79" x 106"
1 Pillow Sham 20" x 26"
1 Coverlet Bedspread 100" x 106"
2 Pillow Shams 20" x 26"
1 Coverlet Bedspread 118" x 106"
2 Pillow Shams 20" x 36"
I ordered the queen size coverlet set in brown. I am impressed with its rich color and how the coverlet also hangs low enough that sheets do not show. Highly recommend. Coverlet Bedspread, beautiful soft in the perfect size. The Cocoa Brown is very rich in color. What a great buy and a great price!! Purchased in king for my master bedroom. Purchased beige color and it blends right in with my decor. Soft to the touch. Great length. The coverlet comes all the way down to my bed frame which is exactly what I wanted. Also it’s very warm considering it’s not thick at all. Very high quality, especially for the price. The size works well with my platform bed. I can leave the sides untucked or not, depending on the look I am seeking. Warm, but lightweight in terms of being breathable. For the price, this is my spring/summer bedding and will most likely purchase another set for fall/winter. The color is true to the picture. I BOUGHT THIS FOR MY NEW 14 INCH MATTRESS. THE BEST EVER.VERY ELEGANT AND LUXURIOUS. BIG ENOUGH TO COVER THE SIDES.THE FABRIC IS SOFT AND WELL STICHED. WINTERS ARE COLD IN MY APARTMENT, BUT THIS ONE IS KEEPING US WARM WITHOUT THE SWEAT. THE KING SIZE SAID THAT THE SHAMS WERE STANDARD SIZE,BUT FOR THE KING SIZE ARE KING .I THINK IT WAS A TYPO. BEST BUY EVER FOR THE PRICE.I BOUGHT THE BROWN ONE.LOVE IT. Gorgeous! Just gorgeous! I was impressed how the coverlet has a longer hang than others I have purchased. Looks fabulous when layered with my duvet and down comforter. Great for Spring, Fall and Winter! Was a bit too heavy for my warmer Summers in Idaho. Great price, very well made, beautiful on the bed alone or layered and also nice weight! Love the quality of the comforter, however one of the pillow shams was torn at the seam. I would have returned it, but I didnt want to wait for a whole new product. It is thick and warm but really is true to the dark gray color as in the picture. The coverlet is very roomy for my king sized bed. I had bought it to complement the smaller sized quilt I bought- no need for a bed skirt and it covers any sheets and blankets that hang down below the quilt. It is well made and a beautiful dark blue. Exactly what I needed at a great price! I love the size of this coverlet! It is larger than average, so i do not need to use a dust ruffle. The material is good quality and the appearance is very nice. I am going to order another one. It looks perfect on my bed. It is much better quality than I expected for the price. It is stitched and the gray is a true gray, but lighter than the picture which I was hoping it was! Very happy with this order. I was very skeptical about this. I have a California King bed that sits pretty high off the floor. This coverlet is. PERFECT!! It hangs long on the sides. Not too thick or thin. I love it. Very happy about this purchase. I think I will order another one in a different color. 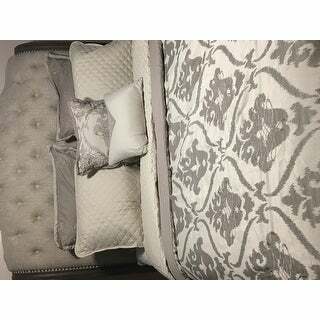 This bedspread is a very nice quality and feels wonderful. I slept like a baby under it. I'm definitely ordering more in different colors. This is a great Coverlet .Extra wide, soft and a great price. Lots of colors to choose from. I needed a brown.I was very sad that the color cocoa was not the right color for my bedroom. I had to send it back. Overstock is a very easy, simple process. Very comfortable quality very good yes I would recommend this product!!!!!!! This is a very simple summery comforter. We purchased because we get very warm at night and like to have something light weight covering us as we sleep. This done the trick. We will purchase more in the future. "Is this spread slippery or does it stay in place during use?" This coverlet is not slippery and should stay in place throughout the night. "Will the Plum color in a King be available again?" "Is this a shiny, silky type fabric?" "What size shams are included with this set?" It will be standard size pillow sham covers. "what size is the king cocoa and is it in fact as dark brown as the pic"